Snow is everywhere. The East Coast of the US is still digging out; the West is receiving its share, too. Although most of us find the snow a cold inconvenience, it also provides inspiration. Trying to recreate a concept of the winter melt was the goal of this 9x12 inch oil painting. If it makes you feel the cold, drab of winter, I have achieved my goal. Watching the news with snow storms blanketing much of the northern United States puts my imagination into summer evening mode. 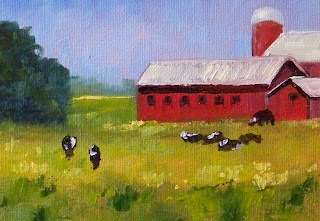 Warm weather and long shadows occupied my thoughts when I created this 8x10 inch oil painting. One of the biggest challenges an artist can face is depicting the human figure accurately. Accomplished figure painters practice every day for many years; I am humbled by their skill. Success with painting the figure is about proportion and value. If one is inaccurate, the painting doesn't work. Thus, on the occasions when the thought of figure painting enters my mind, it is with considerable apprehension that I approach the canvas. This little 4x6 inch oil painting of a lone male figure is the result of my latest figure painting effort. One of my favorite places to visit when the weather is warm is the banks of the Carbon River in Pierce County, Washington. Since the weather isn't warm and won't be for a long time, I painted it in winter. Crisp and cold with a snow sky is the effect I was after. It worked; I've been wearing an extra sweater all afternoon. 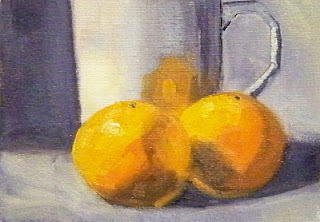 The painting is 6x6 inches on a gessoed hardboard panel. 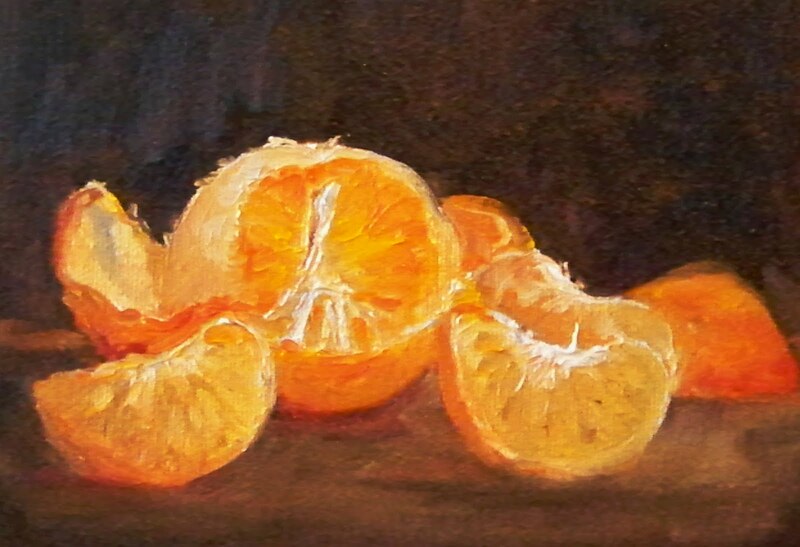 I'm still playing with tangerines. Today's challenge was adding a reflective metal bowl. Painting that was the most fun of all. Capturing the distortion and color of the reflection was easier than I expected. The painting is 6x8 inches on gallery-wrapped canvas and can be purchased online at Small Impressions Gallery for $75.00 plus shipping. Click here to view it in the gallery and add it to your shopping cart. Arranging items for a still life provided some good inspiration for a colorless winter day. I raided the refrigerator and discovered that there wasn't much in the way of color, so these sweet little fruits took full responsibility. I was happy they were there to hang out with me and provide some good company while their portrait was completed. 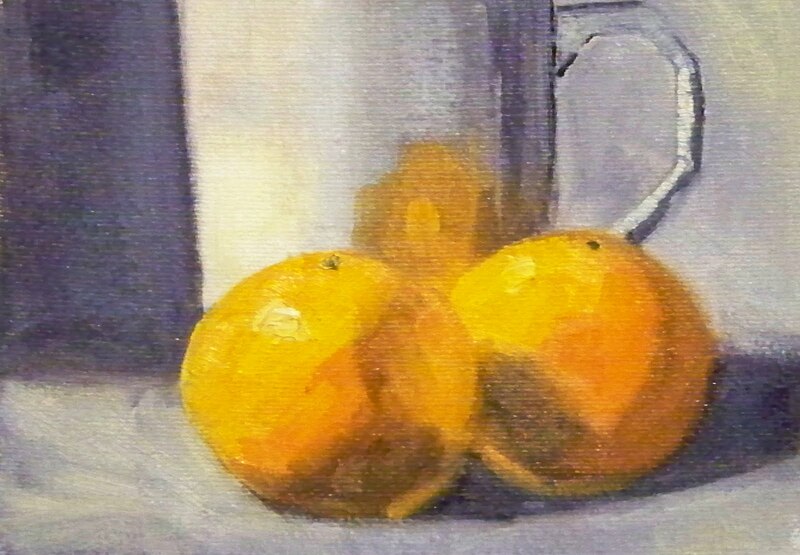 Their portrait is 5x7 inches on a Raymar canvas panel. The paint is dry and it can be purchased for $50.00 plus shipping by clicking on this link. The temperature has dropped again and I'm still dreaming of summer. 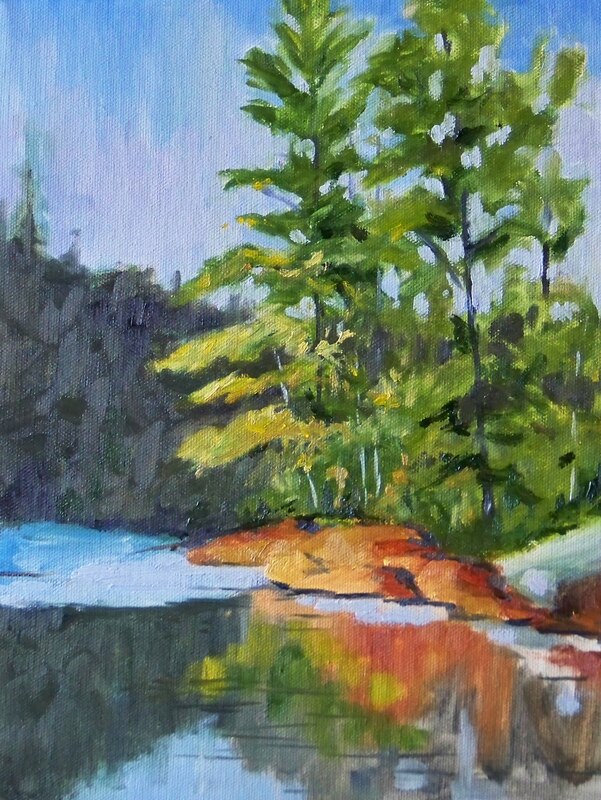 The warm sunlight reflecting on an evergreen shoreline warms my imagination and inspired this 5x7 inch painting. 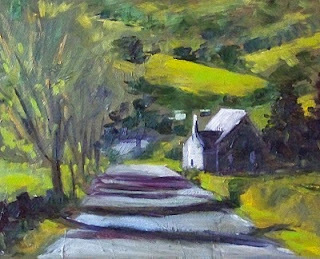 This painting on a Raymar Canvas Panel is for sale for $50.00 plus shipping at my online gallery, Small Impressions Paintings. Click here to view it in the gallery or put it in your shopping cart. I'm ready for some easy living and in my imagination, these cows were enjoying a little leisure time. 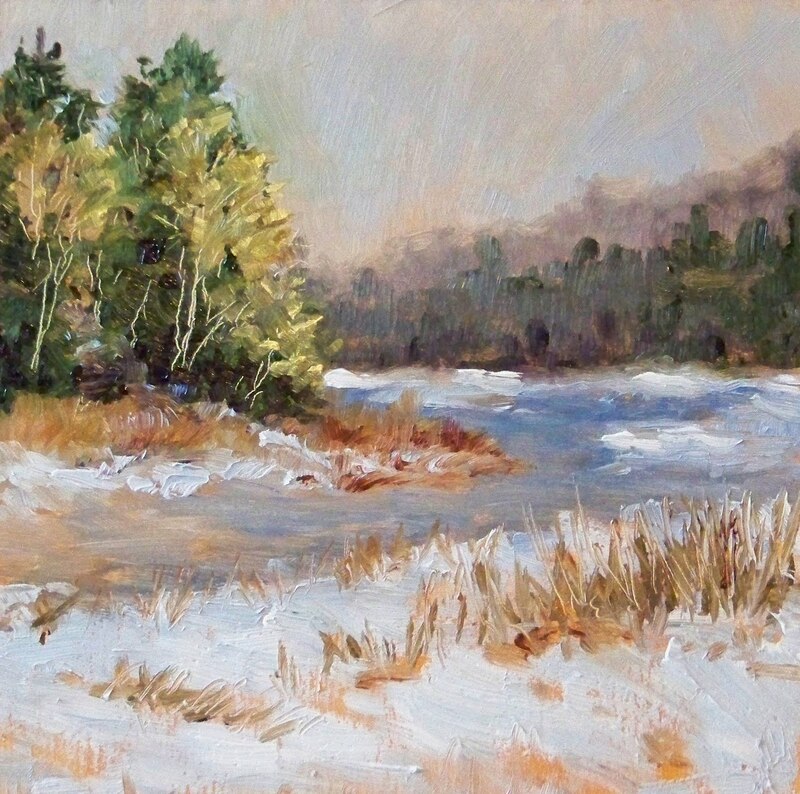 The painting is 5x7 inches on a Raymar canvas panel. This painting has been SOLD. Working on paintings of seascape or boats always challenges me. I think it is because salt water surrounds me and I'm very familiar with the sights and sounds of the coast. 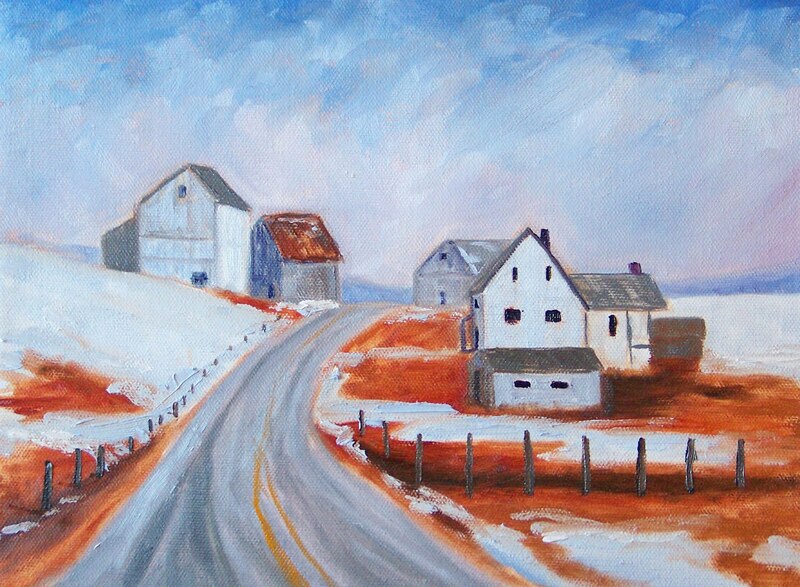 I'm never satisfied with the results of my attempts at painting these local scenes. But, this one made me feel quite satisfied. 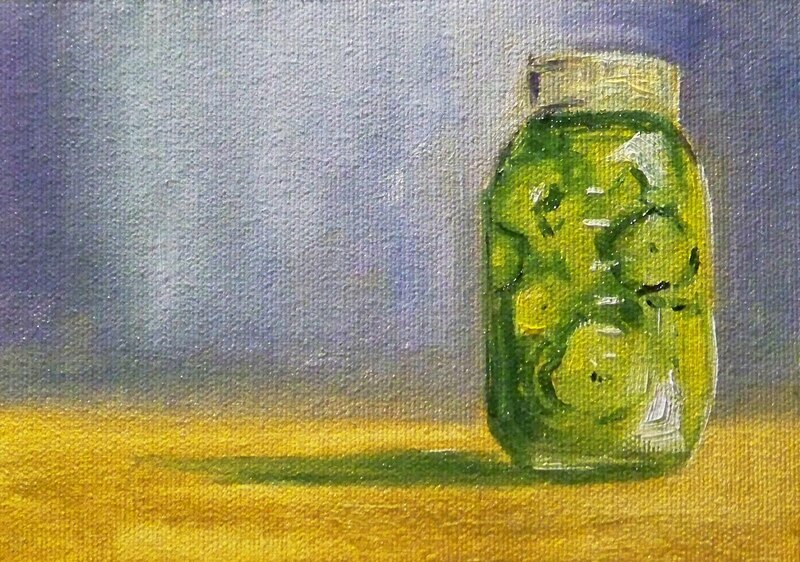 It is small 5x5 inches. 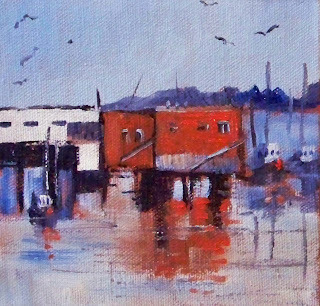 I concentrated on shapes and tried to avoid thinking about painting the sea and boats. Amazingly, I am satisfied with the final product. It is a bit abstract, but I'm wasn't tempted to wipe it out and start over. A delightful success in my eyes! 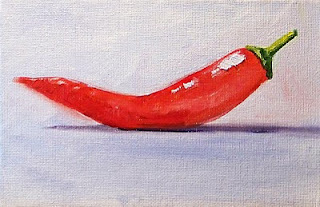 It has joined some of my other paintings at the Small Impressions Gallery at Etsy. To view it in the Gallery and purchase it for $25.00 plus shipping, click here. In the middle of winter when the rain is pouring down and the wind is blowing, these little Mandarine Oranges always bring a sweet, freshness to the day. Yesterdeday was no exception when I sat down to paint these juicy little segments. The painting is 5x7 inches on a Raymar Canvas panel. It will be for sale online at my Etsy gallery when the paint is dry, so check in soon. A recent trip from Seattle, Washington to Portland, Oregon and back inspired a series of little sky paintings. As we travelled along I-5, we were in and out of the rain. The clouds were heavy and dropped water on us in a few whispy sprinkles followed by a downpour and then back to little sprinkles again. 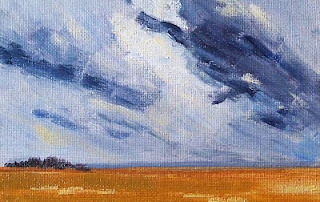 The weather inspired a lot of gazing at the stormy sky and this little 4x6 inch oil painting. This is a silly little painting. 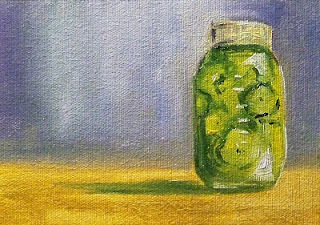 I was captivated by the swirling colors and patterns created by the sliced pickles in this jar. I had to paint it. So there it is, my crazy inspiration--who would have guessed? 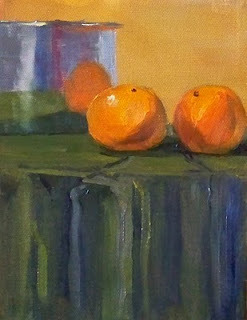 The painting is 5x7 inches on a Raymar canvas panel. This pepper looks like I feel when doing sit ups. That strain in your stomach and the tension on the back of the neck tells me I'm probably doing the exercise incorrecctly. 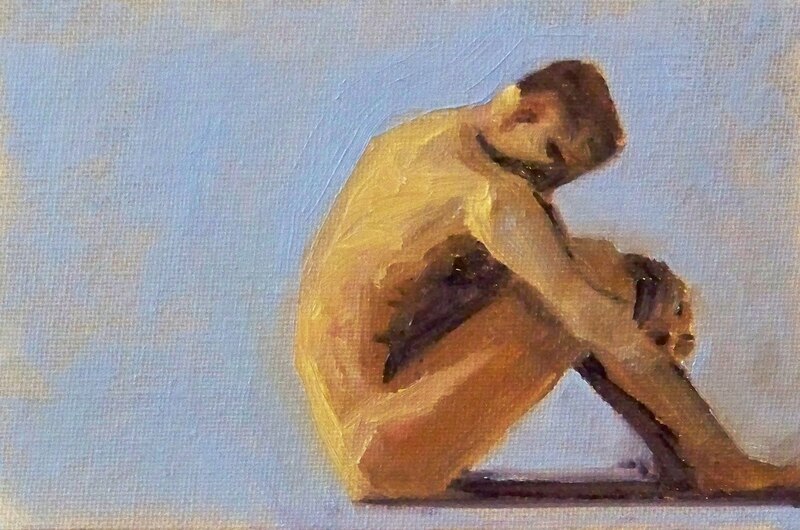 The painting is a sweet little 4x6 inches on a canvas panel and didn't cause me the pain of even one little sit up. It can be purchased online for $24.00 plus shipping at the Small Impressions Gallery. Click here to view it in the gallery. 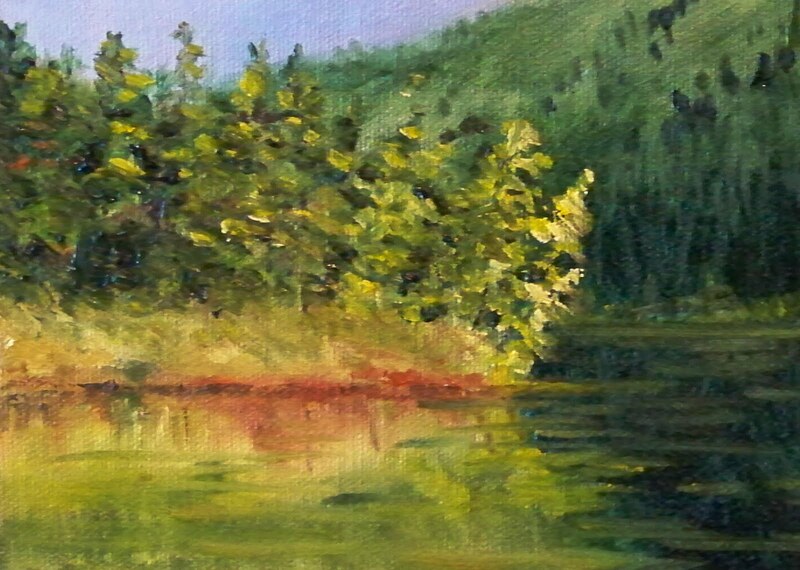 Beautiful evergreens on the shore of a pond inspired this 9x12 inch oil painting. As a native of the Pacific Northwest, I will always love the majesty of the evergreen trees. 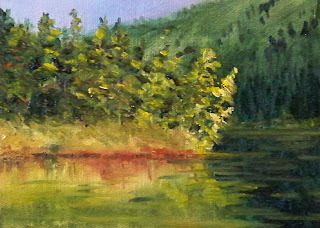 Playing with the reflection in the water was especially exciting to paint.